Since 1974, we have been producing countless awards for many corporations and companies, along with awards for hundreds of athletic organizations. 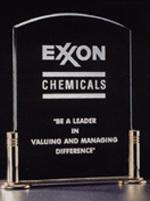 We have kept our promise to deliver you 'quality' service so that you can proudly display your award. We are committed to bringing you the Finest Quality Awards at reasonable costs and deliver most orders within 3 to 5 days. At All-American Trophy, we offer more than just trophies. View our list of famous personalities who have either received or purchased awards from All-American Trophy Company. 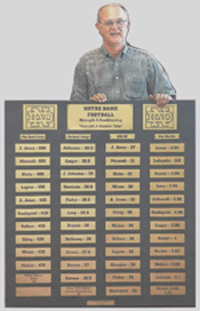 Over the past 30 years, All-American Trophy has provided awards that have been presented to prestigious institutions and dignitaries such as the Former President George Bush, Christopher Reeves, Regis Philbin, University of Notre Dame, Penn State University, and many more. At All American Trophy you can personalize your awards with full color capabilities with beautiful results. Our professional quality is fast and reliable and your satisfaction is guaranteed. We provide our customers with a variety of options including: acrylic, glass, and marble awards in many different sizes, styles, & shapes. 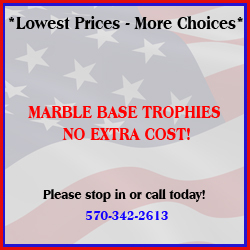 You can customize just about anything at All-American Trophy. We also do laser, engraving, and computerized personalization.